in all the districts of the Chhattisgarh state. For this Applicants from the local / district residents have been requested to submit the application form in the prescribed format on or before May 31, 2017. Interested candidates who hold the necessary qualifications prescribed for these positions can send their application to the department before the last date. 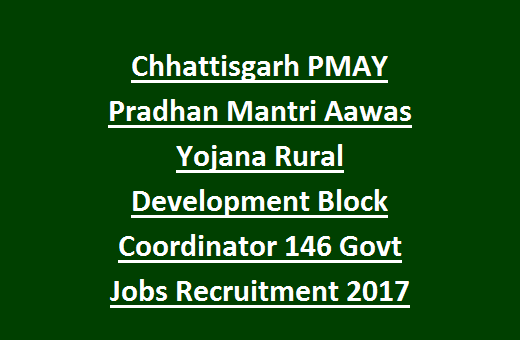 Selection for these Block Coordinator Jobs of Pradhan Mantri Aawas Yojana Read the below given information. Last date to reach the application form to Rural Development Department is 31-05-2017. Name of the Dept: Department of Panchayat & Rural Development Chattisgarh State. Post Name: Block Coordinator - 146 posts. Block Coordinator Salary is - Rs. 23086 / - per month. Candidate must have qualified B.E/B.Tech Civil Engineering from any recognized university. Candidate must have at least 2 years of work experience. Information on the application for employment to the candidate's age between 21-35 years has been set. Age relaxations are applicable for reserved persons as per CG Govt Norms. Selection for this Block Coordinator Jobs will be held based on marks in HSC and Engineering Degree. Eligible candidates can submit their application form to CG Panchayat and Rural Development Department on or before the closing date of 31-05-2017 by 05:00 PM. Applications to be reached to the Respective District Chief Operations Officer of Zila Panchayat. Application is available for download in the official website of Chhattisgarh state @www.cgstate.gov.in. 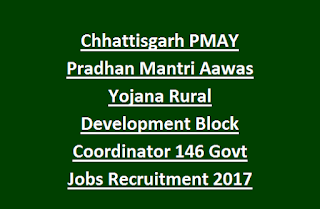 Download Application form and Official Notification for Block Coordinator Jobs of Panchayat and Rural Development dept of Chhattisgarh State.